In the ten years after September 11, 2001, approximately 16,000 service members have died on active duty status. These deaths included accidents, combat deaths, illnesses, suicide, and homicide. Although the study of bereavement in the civilian population is robust, there is little empirical research on the impact of the death of a service member on military families, especially the families of these 16,000 service members. Our previous research through the National Military Family Bereavement Study identified a range of responses in bereaved military families and indicated a need to provide better support for those who are adapting to the duty-related death of a service member. Complicated Grief Treatment is an evidence-based intervention that has been shown to help bereaved people adapt to loss. Yet despite the need and the number of deaths of U.S. military service members due to combat, accident, suicide or other causes, there is no tested intervention for those bereaved by military death. 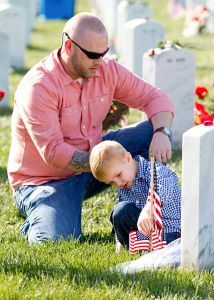 Go to militarysurvivorstudy.org to learn more about the National Military Family Bereavement Study. Go to complicatedgrief.columbia.edu to learn more about Complicated Grief therapy.